Let’s tell you a bit about ourselves. 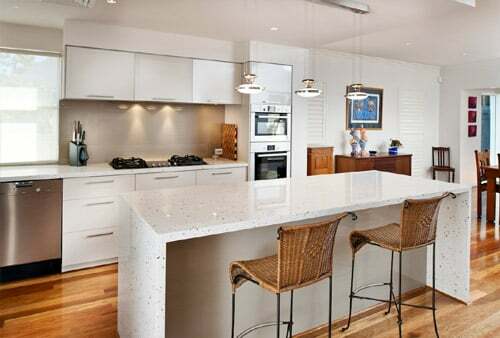 We’re into the type of kitchen design that Perth residents have always longed for. Having been in the kitchen design, installation and renovation field for many years now, we’ve learnt to re-invent our services with the changing times. Last decade witnessed a significant transformation in the living spaces of people’s homes. Thankfully, things are more open-planned nowadays. Once considered merely to be a utilitarian room whose sole purpose was quick food preparation, the modern day kitchen space has now taken shape as the epicenter of a home. When it comes to kitchen design, Perth homeowners want their kitchens to be as stylish as their living rooms, without compromising anywhere on the functionality aspect. We are a multi award winning company and are highly recognised in the industry for our innovative design concepts and world class service – as kitchen professionals we understand and appreciate your unique requirements. This is why we’ve earned laurels from our past clients, have won several awards and are well-known for our customer service. Our entire process right from the time we have our first interaction with you till the time the final kitchen is handed over to you, has one person at its centre – YOU. We work along with you to accommodate your unique kitchen design needs, no matter how much we may have to stretch ourselves. Careful kitchen designing can give a bigger appearance to your kitchen space, provide more storage and improve its traffic flow. Although we’ve changed with the times, we’re not rigid! You decide whether you want your kitchen to be merely meant for food preparation, or would like it to be an area of entertainment. There may be certain preferred activities such as music, internet usage, TV programs, baking etc. you may want incorporated into your kitchen design. All you need to do is let us know and we’ll get it done! Why not contact us and see how we can help!